Today I am featuring the last of the 'this is where I work" photos and travel to Laura Jeanne's home in Canada to see just what it is she is getting up to there. I'm pleased we are finishing on the work spaces of a woman who seems to be a true worker, making do with what she has right now and working for the good of the family unit. My name is Laura Jeanne and I live with my husband and three children in Southern Ontario, Canada. We are trying to move towards the simple life, and dream of living in the country--but right now we are living in a townhouse in the city. I wanted to share pictures of my workspace because this is the first time in my life I've had a place just for work, and I'm enjoying it. My work space is the other half of our laundry room/storage room. We used to use this area as a room for movies and video games--but as our values have changed, this room has gradually morphed into something quite different. In the first picture, you can see the area where I wrap up packages for our business--natural wooden toys that my husband makes in our garage. The toys and boxes are stored above on shelves my husband made, my "table" is a chest freezer which we bought used a while ago in an effort to live more frugally by stocking up on sale items. To the left you can see the solid wood storage shelves my husband built, which now hold my new growing collection of canned goods. 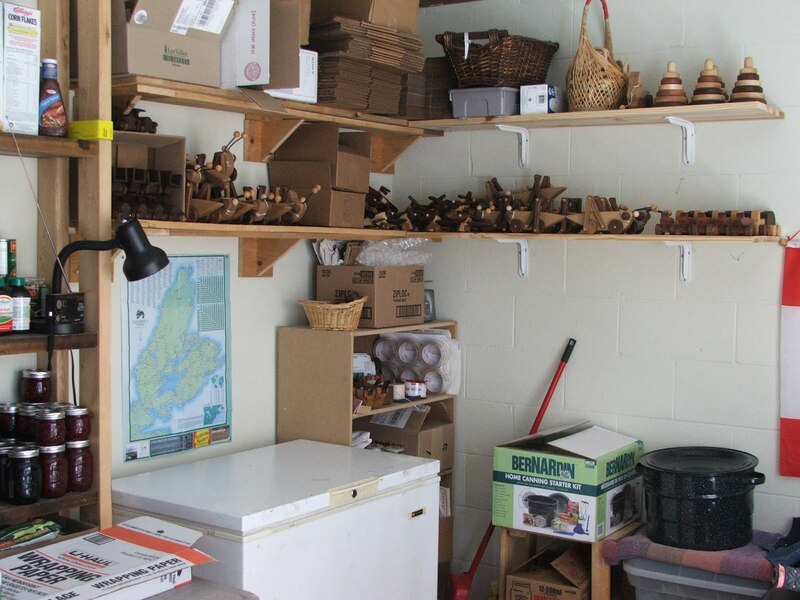 Come to think of it, he also built the bookshelf in the centre of the picture that's holding all the packing supplies, and the little shelf next to that which is holding my canning supplies. Above the cans of jam is a little hand-cranked radio which I use to listen to classical music while I work. 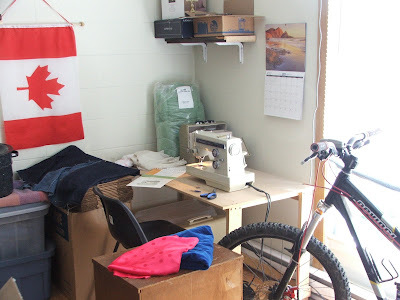 The other picture shows my new sewing area. I've been wanting to start sewing for so long now, but I am intimidated by the machine, which always seems to tangle the thread no matter what I do. I am determined now though to just do it. Scattered around the machine (which is sitting on a desk which is also homemade) are various projects I'm going to finish over the next little while--altering a slip, making some new hankies, and adding a panel to cover the slit in a jean skirt. That lovely blue and red fabric on the side table came from my grandmother's stash, and I'm going to use it to sew a cape for my youngest's second birthday. At least, I hope to sew a cape--I've never constructed an actual garment before so I'm a bit nervous about it. I'd like to thank everyone who has sent work space and kitchen sink photos. I really enjoyed seeing where a lot of you spend your time. We'll do something similar in the future, but for now, we'll give it a rest. Great story LJ. I'm inspired to tell my Dad about your freezer-table. He is about to buy a new hall stand - but perhaps a deep freezer with a nice table cloth will do the job just as well. Then he can bulk buy meat etc. Thanks for the 'making-do' idea. Nice space Laura Jean! Keep at it with the machine -- I am still getting tangles but I'm also getting better at sewing. Laura Jean - Thank you for sharing how you're re-purposed your space. It looks like you are really putting it to good use. Your sewing machine (Kenmore I think) looks suspiciously like the one I owned at the time of my wedding, and which my mother used to sew my wedding dress. Her machine was older, and she chose to use mine, and it did wonderfully well. But there is something I've learned since then about sewing machines. If you are having constant tangles, it is worth a trip to have it looked at by someone who really knows them. A minor adjustment (internal, not the kind the sewer makes) often fixes these kinds of problems. If the tangles are only when you sew off the end of the fabric, be sure that you keep tension on the threads when you do that. If it is while sewing on the fabric, it probably needs something tweaked. Great work space - every inch put to good use. Persevere with the sewing. It will be worth the effort. What a nice space to work in! It is nice that each little area is designated for a certain use. Sure helps with organization! Thank you for showing us your work space Laura Jeanne. And thank you Rhonda for bringing these series to us. Makes me realize that underneath it all, we are basically all the same. Thank you for this peek into the life of someone, working on this wonderful quest.